1 April 2014 - As the search for flight MH370 enters the middle of its fourth full week, what is known about the flight is still greatly overshadowed by what is not known. The key unknowns are the location of the aircraft, and why it diverted from its planned destination. 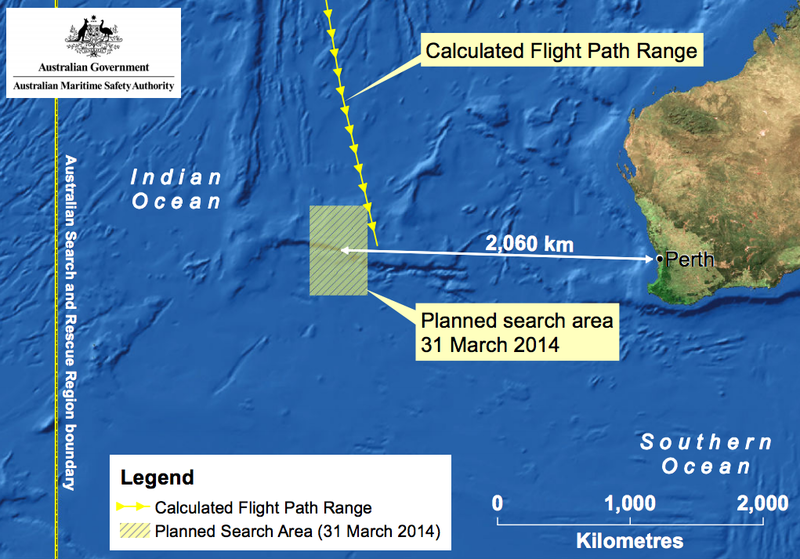 The search is concentrated in the southern Indian Ocean to the west of Australia, in an area that is roughly the size of Nicaragua or Pennsylvania, and so far no part of the aircraft has been recovered. CTV television of Canada asked Dr. Todd Curtis a number of questions about the search and the investigation, and those questions and answers are below. Australia has deployed an air traffic controller due to the crowded search for MH370. Why do you think they felt this was necessary? There has to be some coordination of air traffic in the area. In spite of the large size of the search area, which at 120,000 sq km is about one quarter the size of the Yukon territory (and about the size of Greece or Pennsylvania), there exists the risk, however small, of midair collisions. Centralized coordination of the activities of the search aircraft may also enhance the effectiveness of the search. Malaysia has been criticized for its handling of the search, and on Monday, the government changed its account of the final voice transmission from the cockpit. They told media the final words were ‘Good night Malaysian three-seven-zero’ not ‘all right, good night.’ Why do you think this is significant, and how is it possible Malaysia made an error like this?. It is perplexing how such an error would be made. Like many, I'm waiting for a detailed explanation for this change from the Malaysian authorities. While the Malaysian government has released the transcript, I'm not aware of any release of the actual recording of the air to ground transmissions. While it is normal procedure for accident investigation authorities to release only release relevant parts of a cockpit voice recorder (CVR) transcript and to not release the actual CVR audio, typically the audio content of air to ground communications with air traffic control would be freely available. In fact, in many countries one can legally intercept and even rebroadcast such communications. The site liveatc.net routinely does this for dozens of airports around the world. It’s been more than three weeks since the plane disappeared – are you surprised searchers haven’t been able to find a single piece of debris? 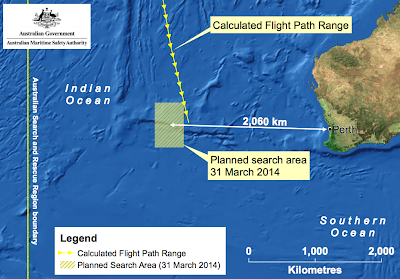 It is not surprising given that it was about two and a half weeks ago on March 24th (16 days after the aircraft went missing) that a general area of the southern Indian Ocean was determined to be the most likely area to find the aircraft, and on March 28th there was a refinement of that estimate that moved the search area to its current location. In short, searchers have had only about five days to focus their efforts in the current search area. In spit of these delays, it is possible that debris has already been spotted from the aircraft, ships, and satellites employed in this search. However, confirmation that any piece of debris is from flight MH370 is a rather slow process that depends on the debris being brought back to Australia for analysis. What about the black box on board – how much time is left to locate it? Based on the Air France flight 447 experience, if the black boxes are relatively intact and the recording media is not damaged, they can be immersed in the sea for at least two years and still retain their data. It is unclear how much longer such devices could remain in the ocean before the data would be at risk. There are so many countries involved in this search, including regional superpowers like India, global superpowers like China – have there been jurisdictional issues that have delayed the search/interfered with the process? There do not seem to have been jurisdictional issues, in part because of a widely accepted framework (Annex 13 to the Convention on International Civil Aviation) which lays out the responsibilities nations have in the event of an airline accident or missing airliner. Specifically, if an aircraft is presumed lost outside of the jurisdiction of any of the signatory nations (in this case, the presumed location is in international waters), the country of registration, in this case Malaysia, has primary responsibility for the investigation. There appears to have been management and coordination issues that have delayed the progress of the investigation. This is partly due to the nature of this event where it was necessary to use military information like radar data from several countries, and unconventional resources and procedures such as the analysis of data from communications and imaging satellites. No one country had all of these resources under their direct supervision, so it is likely that there would have been delays in the process regardless of which nation was leading the investigation. Winter is coming to the Southern hemisphere – what sort of challenges is that going to cause? It is likely that search operations will be hampered by the rougher sea conditions and more challenging weather conditions that accompany winter in that part of the Indian Ocean. It would also depend on the progress made in the investigation by the time winter arrives, and on the kinds of resources used in the search and recovery effort. If parts of the aircraft have been identified at a specific location on the bottom of the ocean, documenting and retrieving the wreckage could potentially take place even in winter. This is Zulfikar from India and I am a technologist and also having some experience of airline industry since my father worked for Saudi Airlines for about 20 years. And I would like to inform the airline authorities that I have an airline security solution concept that can help the search operation systems much efficiently than the present technologies they are having. Search agencies are consuming time and investing huge money in lost aircraft search operations. But there are simple ways to have instant information of any aircraft in the air that not only saves time but also money.. So here is are my comments. 2. Fixing CCTV camera throughout the aircraft or at least in the sensitive areas and take online/instant backup to the earth station . I will be shocked if the airline authorities doesn't know about this solution. Save time and money is important but we are saving millions of lives. What number of plane crashes do we need to reach before we can improve our airline security? To me I think the airline security is totally an embarrassment!! Nothing has worked well, too many gaps, too much talking and waiting. Come on passengers deserve better security, we want to see real action. From JC.